Fall is a great time of year to walk around your neighborhood, state park, or local trail to look at all the colors! Just because your child is an infant does not mean they can not take in some of the sensory experiences that surround them outdoors. Place your child in the stroller, and let them handle acorns, leaves, or sticks-with your supervision. Look for animals, trees that stay green, and be sure to talk to your child to name the items they point to or see. Turn this into a sensory bin experience like this one Play Learn Love shared at B-Inspired Mama. Even infants can explore the fruits of Fall. Find some bumpy gourds, pieces of hay, Indian corn, or apples, and let the little ones feel the different textures. I store the items in a basket or bin for a few weeks during the Fall season so they are easy to grab and play with over and over again. My daughter was enthralled with a bumpy gourd we picked up at our favorite orchard/farm market when she was 7 months old. I let her sit in the grass and touch the gourd. Yes, she put the stem in her mouth…and survived. Supervision is key! It was a great sensory experience for an infant. Name the colors and textures to encourage verbal interaction while your infant touches, looks and maybe even tries to taste. It is a good idea to wash any produce first-even if it is not typically eaten-when you give it to your mouthing infant. 1.) I bought 3 different varieties of apples, washed them, and wrapped each in a piece of tin foil. 2.) I placed the wrapped apples into a baking dish and baked them in a 350 degree oven for 30-45 minutes. Check the apples by pressing them carefully after 30 minutes and just keep baking until they feel soft and a bit squishy in the foil. 3.) Remove the apples from the oven and let them cool. Peel back the foil one at a time and carefully pull off the apple skin. I used a spoon to help me scrape off the apple flesh from the core and placed it into a bowl. You can strain the apple mash (through a metal sieve) to be certain all the seeds and core are removed. Cut open a pumpkin and let your infant see what is inside. Place the opened pumpkin in a dishpan or baking dish so your child can get their hands into it. 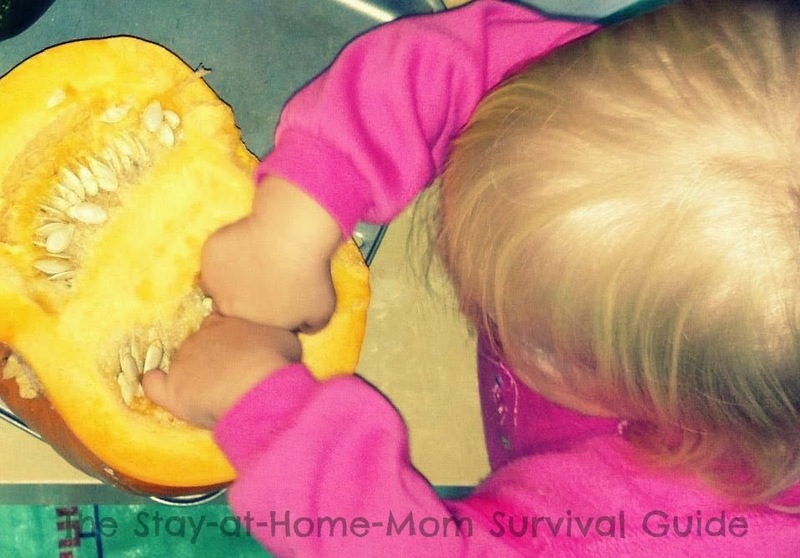 Children love playing with pumpkin guts! Be careful with little ones who are still mouthing everything, but they can touch too. My infants never were able to pull seeds out of the pumpkin. They just felt the texture of the insides. If you prefer a clean exploration, scoop out some of the pumpkin guts and place them in a zip top bag. Seal the bag and your infant can press and touch the bag to move the orange guts around without any risk of mouthing it. This is a sensory activity for infants, a fine motor exercise (using those fingers to pull at the guts and seeds), and a science exploration. 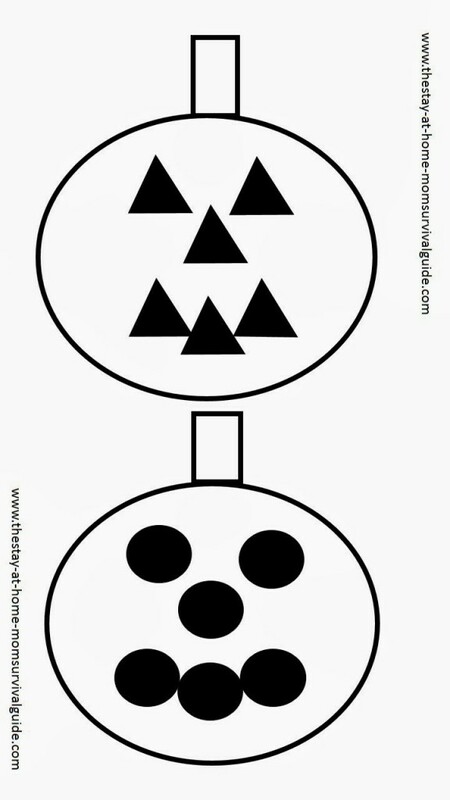 This is a great diversion to keep infants (and toddlers) occupied while the adults take care of the carving if you do this around Halloween. Previously, I shared some of my tips for painting with infants. 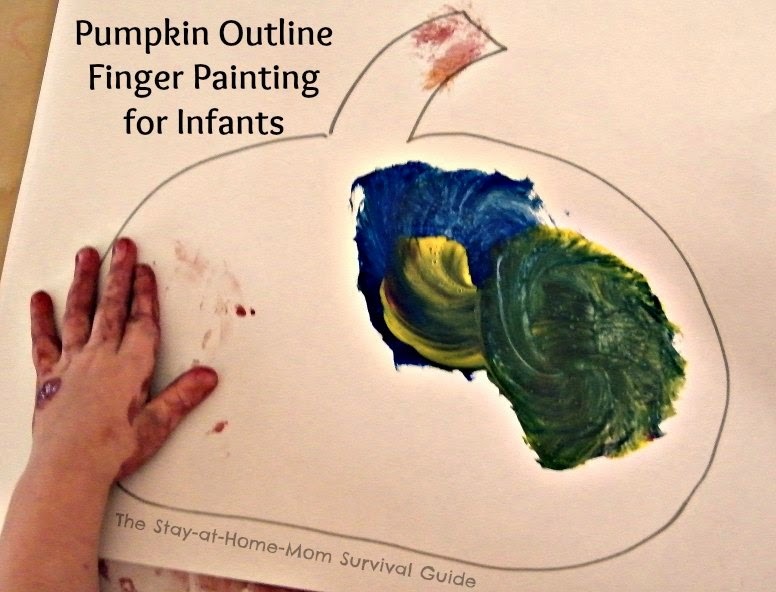 For this pumpkin finger painting activity for infants, I drew a simple outline of a pumpkin on a piece of construction paper. Provide your infant with paint by dabbing a little of the paint onto the paper. You may have to place your child’s hand into the paint to get them started. I talk about the texture of the paint: smooth, cool, slippery. Talk about the shape of the pumpkin: “You are painting a pumpkin shape. It is round and has a stem.” You could provide only one color or offer a couple so that some color mixing can occur. A simple, fun sensory and art activity for infants! One more activity that I did not create myself but found on the website What to Expect. It involves a great visual sensory experience. Since the days get shorter providing us with darkness earlier, this would be an easy activity to work in before your infant’s bedtime. Not a bad way to ease their nerves about being in the dark either! To view it click here. When I was searching for infant activities online I was not happy with what I found. Most activities focus on toddlers and older children, but we do not want to forget about how much we can do with our infants. 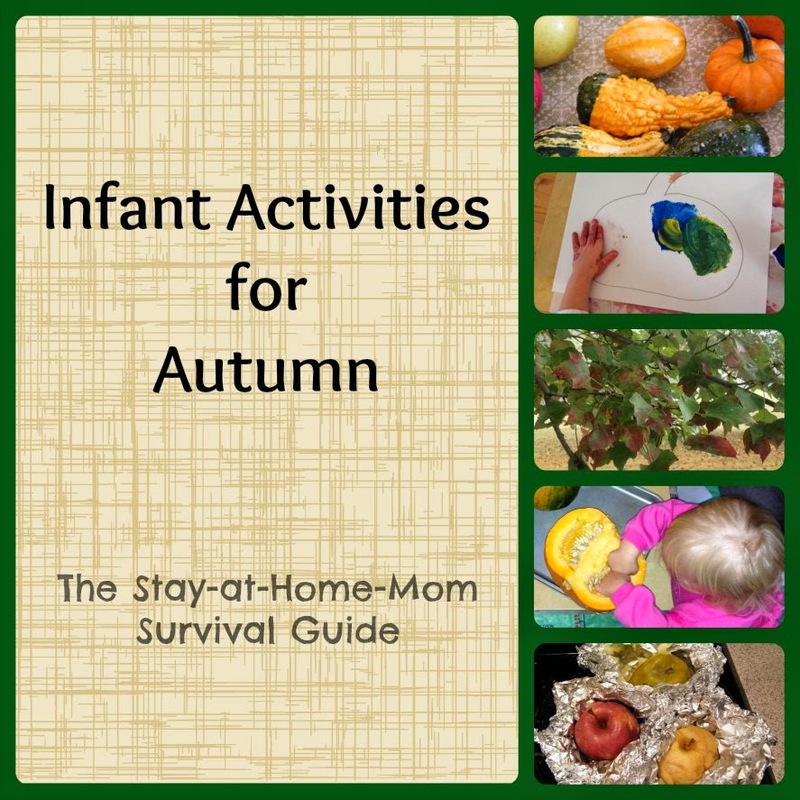 I hope this list will help stay-at-home-moms and all moms engage their youngest children in some Autumn exploration. 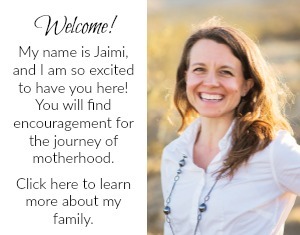 Looking for some direction for your quality time with baby? Fantastic list! I am so excited to let my boy play in pumpkin guts. We also never tried finger paints. He just turned 7 months so I think these will be great for him! Thank you for compiling a "littler one" list; too often they focus on toddler+ like you said. Thanks again! 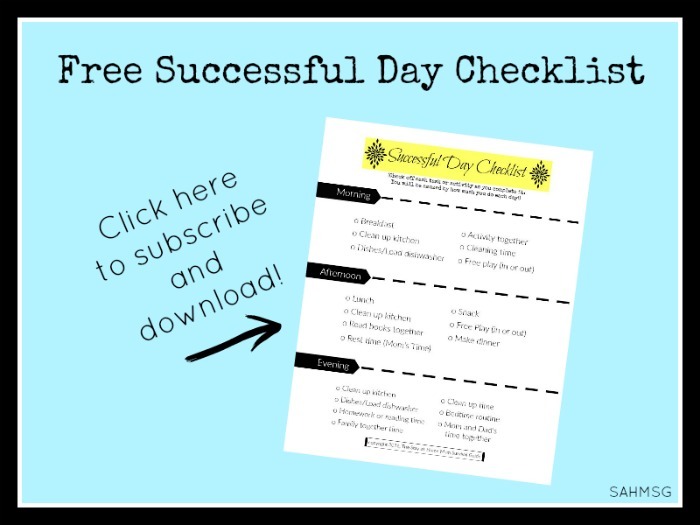 This list will be great for your 7 month old! My twins are 9 months and fully interested in these activities. All of my kids have really benefited from trying them out as infants. I wish you the best-enjoy your little one. 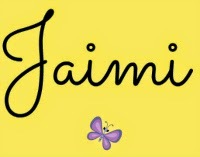 These are great for the really little ones! I wouldn't have thought of the 'pumpkin guts' sensory play – that kind of oozy & squishy is right up their alley!!! Thanks, Anne! Glad that this little list gave you some new ideas to try. I hope you and your little ones enjoy it all! Hi Laurie! I have always used tempera paint with my kids. I find that with it being non-toxic I do not have to worry about it being hazardous and I don't use edible paints because I like to teach my kids that paint does not go in the mouth so they are always safe . Tempera can stain clothes, so just be sure that you have your child wear something that can be stained, or undress them to their diaper so they are easy to wipe up or get right in the bath after. I wish you well! These are really great activities, actually I'm thinking it's perfect for my twin toddlers as well, lol! I think they will particularly love the nature walk. They really think outdoors is such a whimsical place, haha, I'm glad they do think so.